Time for an update - Could this be a first leak of the Moto G2? You are here: GeekSays Technology News » Android » Time for an update – Could this be a first leak of the Moto G2? Time for an update – Could this be a first leak of the Moto G2? Even though it was far from being a top device, Motorola’s Moto G was a real hit! Very well built and with a very affordable price, it soon became one of the best selling smartphones in the world. Still, it’s been a while since the phone was released and people started wondering if they’re going to see an upgraded version. You bet they will. 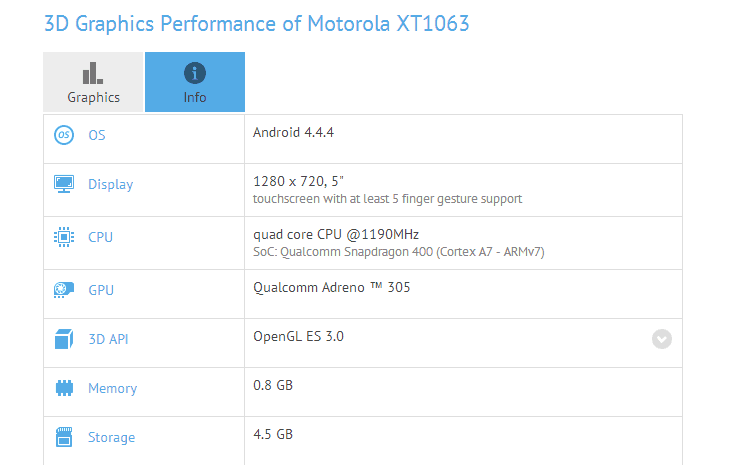 The first details about the Moto G2, because that’s how we call it for the moment, were revealed by a benchmark, which was referring to a device called “XT1063”. Since the current Moto G has the ID XT1032, it’s pretty obvious that we’re dealing with an updated version. Apparently, the Moto G2 will sport a 5″ 720p display, which is a notable boost from last year’s 4.5″. Also, a 1.2 GHz quad-core Snapdragon 400 CPU, alongside 1 GB of RAM and an Adreno 305 GPU will be stacked under the hood. Basically, no differences from the Moto G.
The camera department will also receive an update, as the rear snapper will now have a 8 MP sensor, while the front one will have 2 MP. Last but not least, the operating system will be Android 4.4.4 KitKat. Also, we expect the Moto G2 to be one of the first devices to receive the next operating system update. And this sums up the rumor round-up about the Moto G2, Motorola’s upcoming mid-ranger. What do you think? Will this one be a hit too?